Every military in the world worth its epaulets is investing in drones. Now sensing that drones could be a threat to U.S. troops, the Marines are working on a laser to zap them out of the sky. 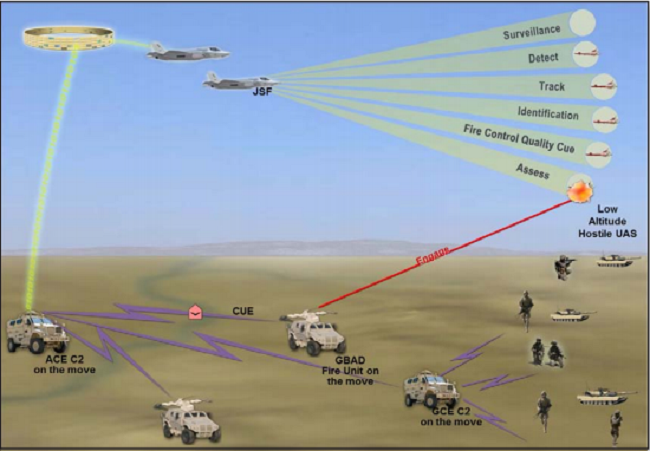 It’s called GBAD — for ground-based, anti-air directed energy weapon. The Pentagon’s Office of Naval Research announced on June 11 it had awarded a series of contracts for the laser, which the Marines hope will augment a looming future shortage of anti-air Stinger missiles. ONR has tested some components for the weapon already, and wants to carry out field experiments with a 10-kilowatt laser later this year. In two years time, it wants to triple the laser’s power to 30 kilowatts. Eventually, the Marines want the entire weapon to weigh less than 2,000 pounds and fit inside a Humvee and its replacement, the still-in-development Joint Light Tactical Vehicle. Here’s how this weapon would conceivably work on the battlefield. At any given time, several thousand Marines are floating around the world’s oceans aboard amphibious assault ships. In the event of a crisis, the Marines are—along with the Navy’s aircraft carriers—one of the two deadliest kinds of tools the president can order off a nation’s coastline. This means the Marines are an expeditionary force. But Marine reconnaissance units landing on a beach or entering hostile territory for the first time could be easily spotted by drones—which are increasingly being deployed by more and more nations. The GBAD is supposed to destroy these kinds of drones. 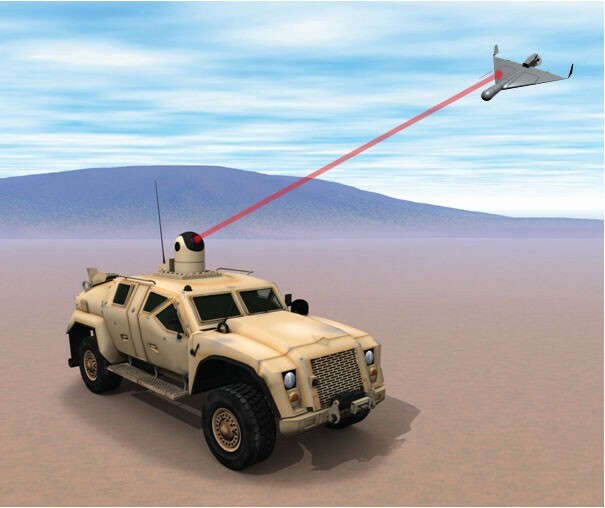 The branch is looking to the F-35 Joint Strike Fighter to handle detecting and tracking incoming drones, and then beaming that data down to GBAD units. The office has also selected the drone-tracking RPS-42 radar to help out on the ground. Right now, the leathernecks in Low-Altitude Air Defense battalions train to shoot down drones with shoulder-fired Stinger anti-aircraft missiles. But in the coming years, the Stinger stockpiles will begin running low. According to a 2013 report from the service, Marine stockpiles in 2019 will drop below the 1,081 Stingers mandated by the Pentagon’s War Reserve Munitions Requirement. This has led the branch to extend the service life of these launchers by upgrading their day/night sights, as well as relying on .50-caliber and 7.62-millimeter machine gun rounds to destroy drones at ranges of less than 500 meters. And, of course, developing lasers to do the job. The Navy is working on lasers for ships, as well. The sailing service plans to deploy one aboard the transport ship USS Ponce in the Persian Gulf this year. But ground-based lasers are trickier. Energy weapons require a lot of power, and you’re relying on small vehicles instead of a huge warships to lug the weapon and power supply around. High altitudes also lower combustion pressures, which makes generators work less efficiently. This has been an issue with another drone-tracking radar known as G/ATOR. The Marines developed the radar in part to track small drones, but its 60-kilowatt power supply began weakening at altitudes greater than 4,000 feet. If the Marines want to zap drones in the mountains, it’ll have to make some trade offs. You don’t want a glorified flashlight, but a laser that is too powerful to work up high isn’t much better. Medium has an app! Sign up for a daily War is Boring email update here. Subscribe to WIB’s RSS feed here and follow the main page here.